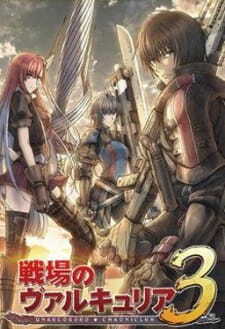 Senjou no Valkyria 3: Tagatame no Juusou is an anime series containing two OVAs based on the game of the same name. What it excels is the exciting action and unique characters, what it lacks is a proper story and background information. During the Gallian war with the Empire, the Nameless is a renegade squadron in Gallia. Although being labeled as enemies by both the Gallian and Imperial army, the Nameless struggle to protect the civilians following their motto, "where the regular army can't, the Nameless can". Trying to fit an entire game into two 30-minute OVAs is quite demanding and ambiguous indeed. You will instantly be lost at the start and will still be confused at the end. I personally did not play the game so I was quite lost throughout the OVAs. Perhaps if you have played the game you will understand the scenario a bit better. Basically it took nearly half-way through the first OVA for me to grasp the situation more fully. So basically, the story involves two factions in war with each other. We have the Gallian Regular Army battling the Imperial Army. The Nameless is a renegade platoon that was originally with the Gallian Army but for some reason broke off with them. The two OVAs shows the conflict between the two armies and the subtle intrusion from the Nameless whose mission is to protect those who are weak. Overall, the story was too confusing to actually enjoy the full potential that this anime is capable of. Think of it as a story with no beginning or end; but rather takes you straight to the climax with little background information at all. If this anime was a full length series with a proper introduction and ending, it would have become an awesome anime to watch. The art was actually well done with nice textures in backgrounds and sceneries. The characters all looked unique and wonderful with their distinctive uniforms clearly visible for the viewer to distinguished the different factions. Animation was fluid and wonderfully done and the battles were highly detailed from the tanks to the rifles. The voice acting was quite well done and somehow the production team managed to find plenty of voice actors for the large cast of characters in the two OVAs. Theme songs were rather good and suited the overall theme pretty well. By it's presentation, you can instantly tell this anime is based on some game. I was thoroughly impressed by the sound quality in this anime. The characters weren't fully developed or investigated in the anime so I only got to see what their personalities and attitudes were like from the way they acted in the anime. I have no idea whether if one side is right or the other is wrong since the anime does not explain anything about the characters except that they are fighting each other for some unknown reason. I quite liked the Nameless as they are the most interesting of the group that consists of uniquely different individuals that somehow manages to cooperate with each other quite well. Overall, I would say that the anime was disappointing yet interesting. The lack of a proper story structure and character development ruined what seemed to be an anime with lots of potential. The characters were great but the lack of detail made them quite unmemorable indeed. Somehow though, the anime does manage to keep me engaged right to the end with a couple of small skirmishes and a large tactical battle in the end. If this anime was fully fleshed out and extended, it would have been an enjoyable anime for many. The lack of a properly structured story and character development really dragged this anime down. Simply wonderfully illustrated and animated. Characters looked great and the backgrounds were highly detailed. Voice acting was excellent and theme songs were appropriate to the theme. Little character development meant less attachment to the characters. Here, we see very little information revealed about the characters. It was enjoyable to watch the skirmishes and battle play out and the tactics involved, but other than that, it was like walking in a labyrinth; lost but exciting. It you disregard the story or pretend to know everything you will enjoy this anime. Perhaps his anime will make more sense to those who have played the game. As for me, I was pretty lost throughout the anime.